Arrive in Ulaanbaatar, the capital city of Mongolia and transfer to your hotel. Have a relaxing lunch at the hotel. Head out for a half-day city sightseeing tour with a visit to Gandantegchinfen Buddhist Monastery, the world-famous and uniquely Mongolian temple, which is home to a 25m gold-plated Buddha and numerous small working temples. Watch the monks chant and spin the prayer wheels, and afterwards pay a visit to the velociraptor skeleton at the National History Museum. Dine out in town and stay overnight at the hotel. Flight to the South Gobi, a one and a half-hour flight. The Gobi is one of the most famous and unique desert regions in the world. The Gobi is made up of varying landscapes and is known for its unique natural settings and rich wildlife. 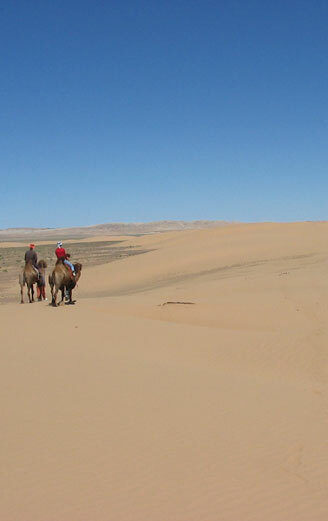 Transfer to a tourist camp, where you will stay in a ger, a traditional Mongolian nomad dwelling. After breakfast drive to Bayanzag. On arrival in Bayanzag have a picnic lunch, after which we drive back to the camp. In the afternoon your training in the fine art of camel riding begins. Day Four is the first day of the camel ride. Ride your camels through canyons and sand dunes for about 30km, dismounting for lunch along the way. Our driver and cook stay ahead of the main group to set up camp and prepare the meals. Camp overnight at Nomgony Ar. Rouse yourself and your camel for the ride to Adag Nuur and the exquisite Seruun Bulag oasis near the Hongoriin Gol River, at an altitude of 800 meters, located on the northern slope of the Sevrei and Zuulun mountains. Visit a local camel breeder's family and experience the traditional customs and lifestyle of local residents. Camp overnight by Adag Nuur Lake. Drive by 4WD jeep the 180km back to the tourist camp, and stay in ger accommodation overnight. Catch a flight back to Ulaanbaatar. In the afternoon visit the Bogd Khaan Winter Palace Museum, a temple complex with beautiful thankas and the taxidermy collection of the eight Bogd Khaan. Check out the Natural History Museum/which is full of dinosaur eggs and skeletons uncovered in the Gobi. Watch an evening performance by a Mongolian folklore group.